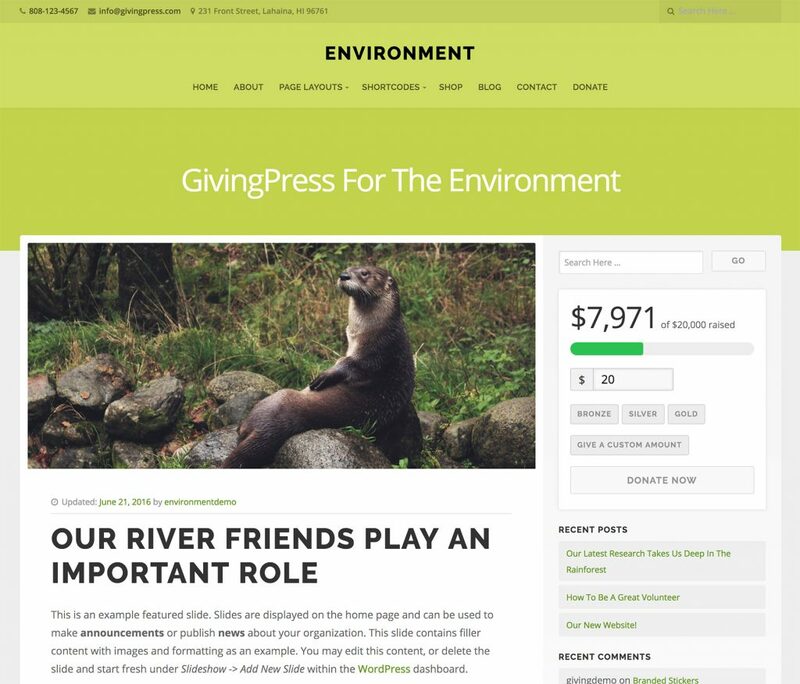 The GivingPress Pro theme is a WordPress nonprofit theme created for organizations. The theme is fully responsive, customizable and packed with features. Signing up for a GivingPress Website is an easier way to start building a website for your nonprofit organization. The GivingPress Pro theme is a responsive WordPress nonprofit theme packed with features and options. It’s a professional theme that can be customized to suit the needs of any nonprofit website. The clean and modern design features a responsive framework that molds to any mobile device, meaning your organization can reach more people, more efficiently. 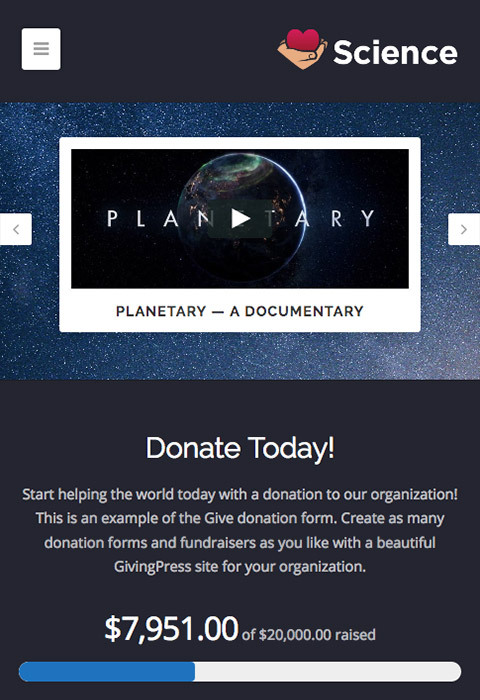 It’s easy to accept donations on your nonprofit website using the GivingPress Pro theme! 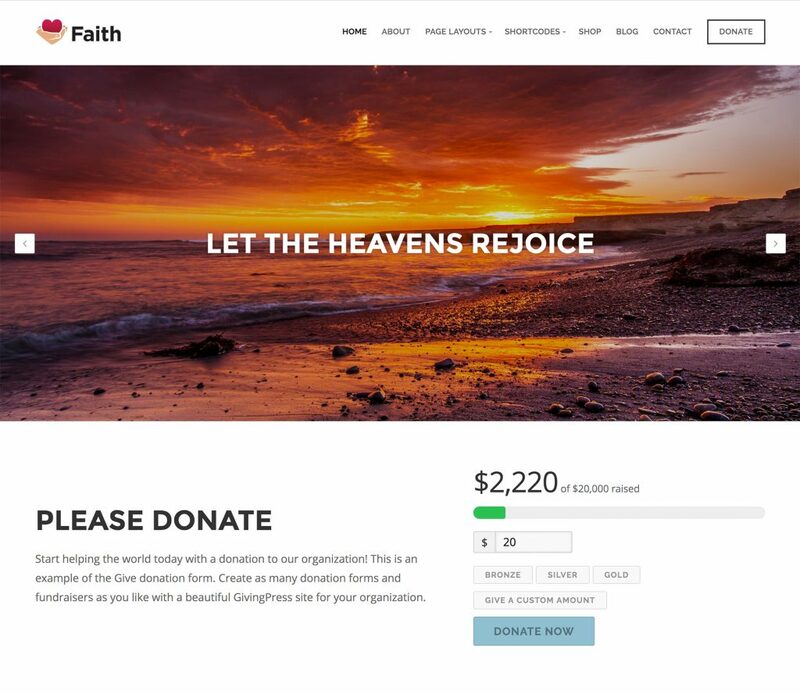 Custom donation forms can be displayed on the home page and throughout your website. Nonprofit organizations that accept donations on-site are guaranteed to receive more donations from contributors. GivingPress Pro utilizes the WordPress customizer for an easy setup process. First of all, you can edit the appearance and content of your website while watching your changes take place in real-time. Also, the theme contains starter content upon a fresh installation. 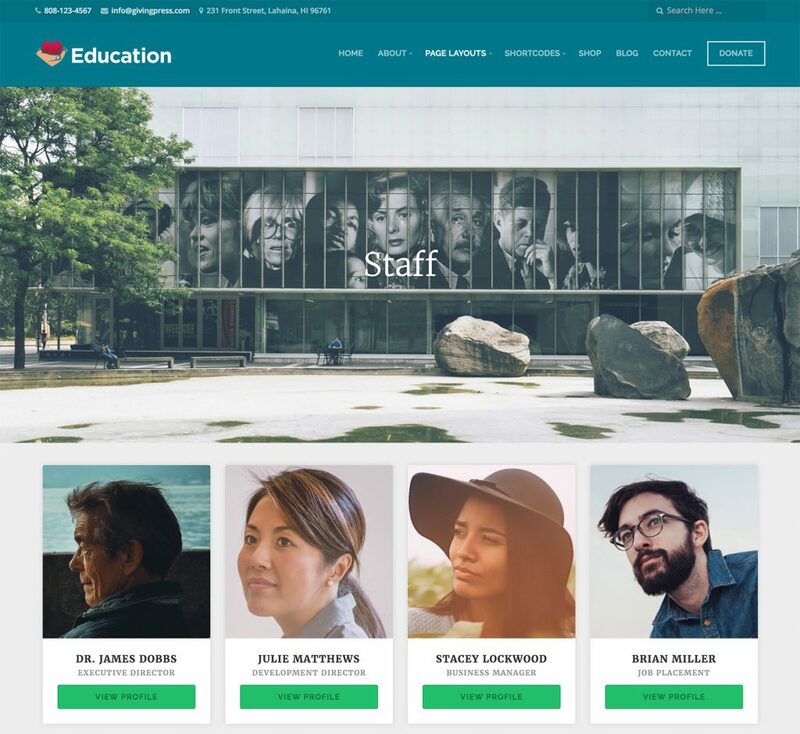 Starter content was first made available in WordPress 4.7, and provides example content in the customizer when creating your website for the first time. GivingPress Pro is simple, yet robust. Should you wish to take the setup further, the theme is packed with custom features. There are a variety of custom post types, page templates, custom widgets and options for virtually any desired layout and look. The theme already looks amazing upon initial setup. However, the features can be pushed further for a nonprofit website that is truly unique to your brand. Users can feature important content in the home page slideshow with featured images and videos. Multiple menu locations are available with the theme. Therefore, adding site navigation or social media icons throughout your site is simple. If your organization doesn’t have a lot of content to display on your website, no problem! GivingPress Pro displays as much or as little content as you want without sacrificing the appearance of your website. Customers can display custom widgets for personal profiles, team member sections, custom content sections and simple donation forms. The home page layout is highly customizable using the custom widgets. In addition, the theme features several color change options. GivingPress Pro works beautifully out-of-the-box or with any color and layout combination you desire. Is search engine optimization a priority for your website? This WordPress nonprofit theme is developed with SEO in mind. It features the right headings and HTML code in the right places. So, when Google starts crawling your website, it will find the most relevant content to increase your search rankings. The features of GivingPress Pro provides your nonprofit organization with everything it needs for a modern website. We have hand-picked the best WordPress plugin solutions for nonprofits, and integrated them into the GivingPress Pro theme. 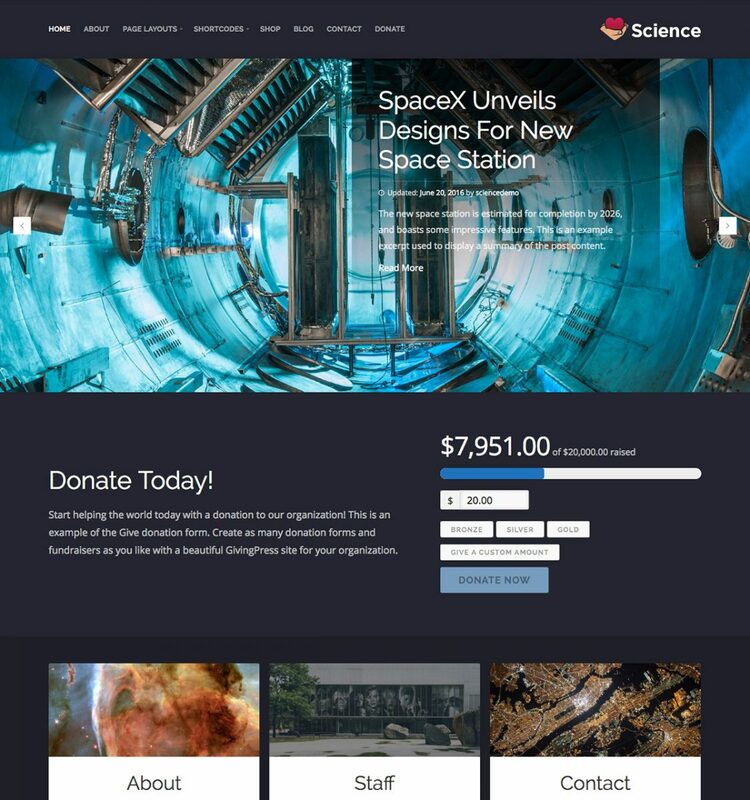 As a result, the WordPress nonprofit theme is compatible with the Give WP plugin for accepting donations and creating fundraisers on-site. In addition, the theme is fully compatible with the powerful WooCommerce plugin. This integration makes it simple to create an eCommerce storefront, and sell products to fund your organization. We have been designing and developing WordPress themes and solutions since 2008. Our sister company, Organic Themes, has been a WordPress partner for several years. We have provided themes for literally hundreds of thousands of WordPress powered websites. So, customers can rest assured that GivingPress products are of the highest quality, and created by professionals that have been doing this for a long time. We regularly update and maintain the GivingPress Pro theme for our community. We are continually adding new features and functionality to the theme. Customers can use GivingPress any organization type! Team members for your organization can be displayed! An endless variety of colors and layouts! Display featured content in a slideshow on the home page!